All three have some common elements and some specific content for each audience. We are social media enthusiasts. We are also HR professionals. We both credit getting social as having a huge impact on our careers, as well as our personal lives. Our platform of choice is Twitter. It is where we met each other, and where we first encountered a warm, engaging and welcoming community of HR professionals. We both believe that social media represents a huge opportunity for HR professionals; in learning, in communications, in all of the people stuff that we do. Only there is a problem. There is a lot of risk-averse, unhelpful advice “out there” about social media. It is something we have blogged about (a lot). There is also fear and far too many myths and unnecessary barriers. We realised that some of our fellow HR professionals needed a little help to learn how to get social and to be able to help their organisations do the same. Digital and social technology is only going to grow – and so therefore will the gap between those who have these skills and those who do not. 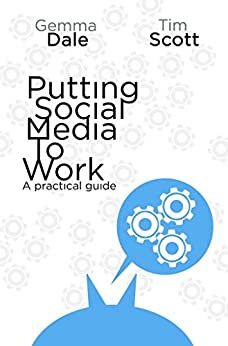 This is why we wrote the first book in the series, ‘Putting Social Media to Work: A Practical Guide’. Only then, we found that we kept having the same conversations with other people that we met. People that, for the most part, were running small businesses or independent practitioners. They kept on telling us that they knew they ought to be on social, but they didn’t know how to, or what to say, or how to find the time. These conversations led us to bringing out a revised version of the book just for small businesses. And then we wrote a third version, aimed once again at something we really believe: that social media represents a real opportunity for the leaders of organisations. So they got their own version: a guide for the busy executive. All of these books are about practicality. Offering suggestions, tips, jargon guide and myth busting. Pragmatic and practical. That is what we are all about. You can purchase the books in hard copy or as a digital download from Amazon right now – please click here to go straight there! We offer social media training for companies and individuals and we also offer a full range of HR consultancy services: find out more on our main website.